More than 400 of the Bay Area Houston Economic Partnership’s closest friends joined together on Wednesday, Sept. 14, 2016, to celebrate the organization’s 40th anniversary. The Crystal Ballroom of South Shore Harbour Resort and Conference Center featured four large displays covered with specially selected photos spanning each of four eras: the Formative Years 1976-1991, Building the Foundation 1992-2001, Regional Leadership 2002-2008, and Expanding Influence 2009-Present. There were elaborate models provided by NASA Johnson Space Center and Lakewood Yacht Club member Frank Clements that were a feast for the eyes. Additional feasting included an elaborate buffet that garnered rave reviews for flavor and presentation. A jazz trio, the "LabWorks” Band, provided enjoyable background music throughout the evening. Introduced by Dr. Bill Staples, president of the University of Houston-Clear Lake and emcee of the program, Bob Scott, chairman of the Clear Lake Area Economic Development Foundation (CLAEDF) from 1983-1986, spoke about the Formative Years. CLAEDF was rebranded as the Bay Area Houston Economic Partnership in 2003. Joe Barlow, one of the founders of the organization who served on the board for over 25 years, remembered the years of Building the Foundation. Sandy Johnson, president, Barrios Technology, served on the board from 1994-2011. She spoke of Regional Leadership. Current BAHEP President Bob Mitchell addressed Expanding Influence and how much economic development has changed in just a few short years. Jim Reinhartsen, president of CLAEDF/BAHEP from July 1992 through December 2007, was recognized with a heartfelt standing ovation for his outstanding leadership of the partnership. 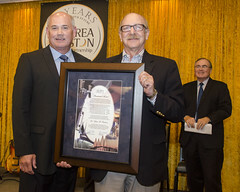 Just before the program’s conclusion, in a surprise presentation, Mitchell gave the prestigious Presidential Award to Dr. Glenn B. Freedman for his unique guidance which has contributed greatly to BAHEP’s success over many years. It was a very special award which further enhanced an incredible evening. 2001 Lockwood, Andrews & Newnam, Inc.
2010 Lockwood, Andrews & Newnam, Inc. The planning and staging of the 40th Anniversary Celebration required a considerable commitment from the members of the 40th Anniversary Committee. Their effort exemplifies the same dedication shown by so many supporters of CLAEDF and BAHEP over 40 years. A special thank you is also extended to BAHEP staff members C.A. Shields and Jimmy Spence whose work on the set-up and tear-down of the event, as well as providing technical expertise on building this web page, was invaluable. to flip through the program's flip book!